* The advertised Lease is a rental-purchase agreement for new merchandise. Unless you exercise your Early Purchase Option, to acquire the merchandise you must make 52 weekly payments of $14.00 (plus tax & delivery), for a $728.00 (plus tax & delivery) Total Cost/Total of Payments. This includes a $349 Cash Price3 and a $379 Cost of Rental. 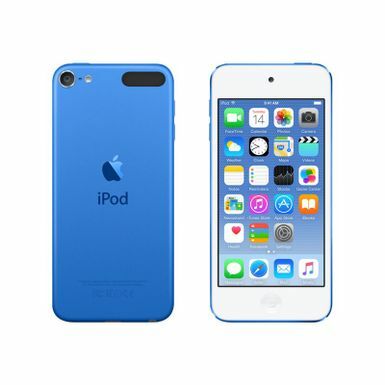 The blue 128GB iPod touch from Apple has now reached its 6th generation, offering a music player, video camera, pocket computer, and portable gaming device, all in a single, sleek, anodized aluminum finish with up to 40 hours of battery life. The iPod touch offers a powerful A8 processor as well as a Retina display with multi-touch interface. iPod touch features an A8 chip built on 64-bit architecture. This desktop-class chip features excellent GPU performance - so the graphics in your favorite games are more responsive and look more vivid than ever before - and CPU performance is also faster. To get great graphics performance out of the A8 chip, the Metal technology was created. It allows developers to design highly immersive console-style games. Metal is optimized to let the CPU and GPU work together to deliver detailed graphics and complex visual effects. So every imaginary world feels more realistic. iPod touch features an amazing 8-megapixel iSight camera and an improved FaceTime HD camera, so you can take some of the most stunning photos and videos you've ever captured. These cameras come with features like slo-mo and burst mode, as well as better noise reduction and improved face detection. And with iCloud Photo Library, you can easily access, edit, and share your photos on all your devices. Slow down life's fast moments. The slo-mo feature lets you shoot HD video at 120 fps in 720p. You can even record and then select the portion you want to slow down. Burst mode captures 10 photos per second and can be triggered simply by holding down the camera button. As you shoot, your iPod touch analyzes every shot in real time. Now you can create remarkable time-lapse videos and iOS does all the work. Just set up your iPod touch, select Time-lapse mode, and tap Record. You'll have an amazing movie, whether you record for 30 minutes or 30 hours. Burst mode helps you take great self and group portraits by continuously capturing 10 photos per second. iPod touch analyzes every shot in real time, comparing sharpness and clarity and even detecting when someone's eyes are closed. Then iPod touch suggests individual photos or a sequence of photos that you might like best. The advanced sensor enables beautiful HDR photos and video with great dynamic range, automatically giving you better-looking FaceTime calls and selfies. FaceTime camera has improved face detection to recognize faces faster and more accurately. It also improves blink detection and smile detection to help you look your best in selfies and group shots. With exposure control, the FaceTime camera lets you lighten or darken your photos and videos with a simple nudge. The same exposure control is also on the rear‑facing iSight camera. iPod touch includes the advanced wireless technologies. When you're connected to a Wi-Fi network, you can make FaceTime calls, send messages, post photos, and download your favorite games and music. You'll experience extremely fast Wi-Fi speeds. 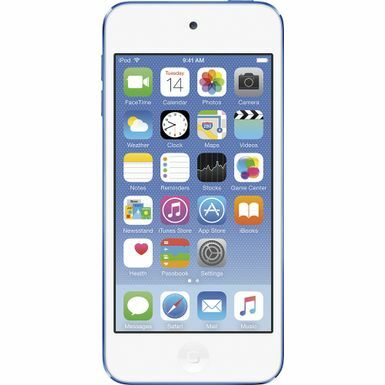 iPod touch also supports Bluetooth technology, so you can connect a pair of headphones for listening to your favorite tunes or a game controller for racking up a high score.